Krzysztof Grudzien, PhD graduated with distinction the Electrical, Electronic, Computer and Control Engineering Faculty of The Technical University in Lodz. He obtained PhD in 2007. He started work at Computer Engineering Department in 2001. 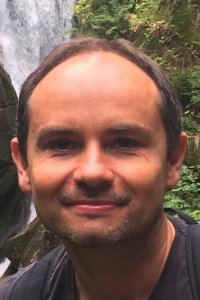 Dr Krzysztof Grudzien spent 6 months at INSA Lyon in 2009 (April – October). Within the DENIDIA project his works concerned the use X-ray tomography system and Electrical Capacitance Tomogray system (ECT) to monitoring gravitational discharging process of silo. Electrical Capacitance Tomography (ECT) belongs to the non-invasive imaging methods for industrial processes. This technique can be applied in monitoring and diagnosis systems. In order to better interpret ECT measurement data and estimate error of ECT measurement series of experiments using ECT and X-ray tomography were conducted. Comparison measurements for these systems were performed for the same process. The subject of investigations was gravitational flow inside the silo (fig.1.). All measurements were accomplished in INSA Lyon at X-ray tomography laboratory.